This transparent box drips, mists, flashes, and glows in sync with the sky outside your home or anywhere else in the world. It’s easy enough to represent the weather using animation. 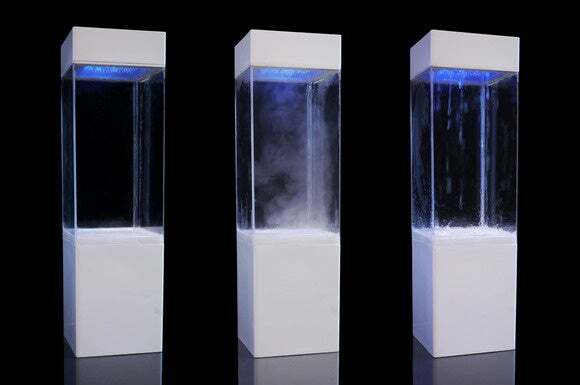 Ken Kawamoto’s Tempescope can physically reproduce weather conditions—rain, fog, clouds, and even lightning—from anywhere inside its cloud-connected enclosure within the confines of your home. The tabletop device acts out the weather forecast for its local area, or you can use a mobile app to synchronize it to the prevailing weather conditions in just about any location around the world. The app also has a “manual” mode whereby you can instruct it to enact a weather phenomenon of your liking. It sounds like an amazing way to receive weather forecasts, and the Indiegogo campaign to transform the Tempescope from concept to retail product has attracted pledges in excess of $220,000 from more than 900 backers. With 28 days left to go, it looks as though the campaign will likely reach its $398,000 goal. This is a fixed-funding campaign, so it will be funded only if it reaches that target. The Tempescope owes its existence to one man’s post-vacation musings. The story goes its, inventor, Tokyo-based software engineer Ken Kawamoto, got the idea for the device on his return from a vacation in the Marianas in 2012. “[Ken thought] how great it would be if he could just take the skies home with him. “Having received much interest from other DIY enthusiasts, he created an ‘open source’ version of the Tempescope which was designed to be buildable with readily available material if you have the right tools (and lots of free time).” Kawamato would later realize that this was too much to ask of most DIYers, and that the whole thing needed to be made more accessible and affordable. You can pre-order the Tempescope in the form of ready-to-assemble kits from Indiegogo: Choose between the $199 standard model and a $249 model that can be laser engraved with a custom message. Both are expected to ship in April 2016. The impact on you at home: It would be too easy to dismiss the Tempescope as this century’s equivalent of the Lava Lamp. Sure, watching it rain inside your house won’t be such a novelty after a while, but the value of seeing a physical representation of the day’s weather before you leave the house—without having to consult an app—will never dissipate.